After identifying the underlying task or “job” the customer is trying to accomplish, the Jobs-to-be-Done framework in product design helps product teams and designers mold their product to fulfill that job. Great ideas may seem like they are available everywhere. Alexa is adding artificial intelligence to the average household, and Tesla is changing our relationship with travel. Yet those success stories are one in a million. The Jobs-to-be-Done framework enables UX designers to break down customer needs into specific process steps. The resulting “job map” provides a structure that makes it possible to turn customer needs into product solutions. 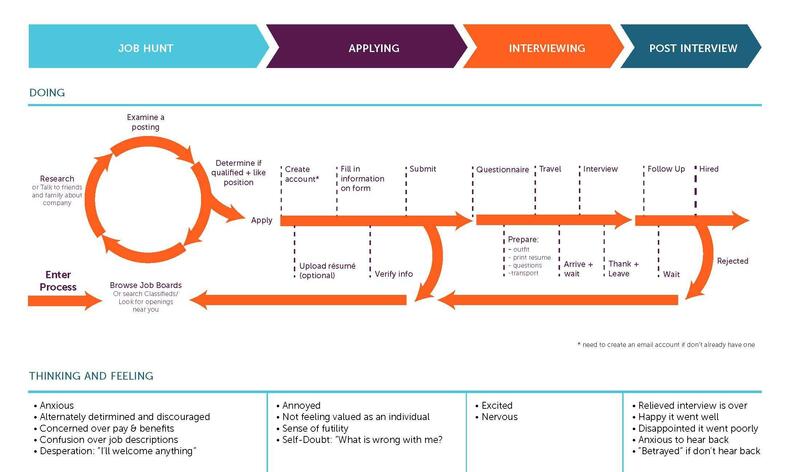 This “job map” demonstrates the tasks a job applicant has to go through when applying for a job. “More than 50 percent of newly launched products fall short of the company’s projected expectations. Only 1 in 100 new products cover its development costs. Only 1 in 300 new products has a significant impact on customer behavior, the product category, or the company’s growth trajectory.” – Steven Johnson writes in How We Got to Now: Six Innovations That Made the Modern World. Using the Jobs-to-be-Done method, it becomes easy to see that people don’t really need a quarter-inch drill bit but a quarter-inch hole. They’re not buying just ice cream but also celebration, bonding, and indulgence. This simple shift in perspective opens up new insights about the product’s customers and a wealth of hidden opportunities. Jobs-to-be-Done is a toolset that can help improve any company’s odds of success. Clayton Christensen himself gives the best introduction to the concept when he talks about his experience consulting for McDonald’s. Initially, McDonald’s gathered customers by market segmentation and asked them to describe their ideal milkshake—does a thick milkshake taste better than a thin milkshake? Do you enjoy a chocolaty flavor or a fruity flavor? Nevertheless, based on the feedback, research showed that reinventing their milkshakes did not lead to an increase in sales. Christensen and his colleagues spent some time observing McDonald’s customers in an attempt to find out what motivated people to buy a milkshake, and to their surprise discovered that nearly half of the milkshakes were purchased around 8:30 am. Their research showed that many of the customers shared a similar story—long, boring commutes and an expectation of a hungry morning. They also always had one hand free, and often wore clothes they didn’t want to get messy. The Jobs-to-be-Done framework helped McDonald’s recognize there was more being accomplished for the customer than simply providing an ideal milkshake. Realizing this, the company created a thicker breakfast milkshake that contained pieces of fruit and lasted longer. This new direction helped increase their value as well as sales to customers. So, what job was the milkshake actually accomplishing for the customer? New York consultant Alan Klement describes “Jobs-to-be-Done” as the “process a consumer goes through whenever she aims to transform her existing life-situation into a preferred one, but cannot because there are constraints that stop her.” The milkshake helped transform the morning commute into a more preferred situation. In view of this, we can see that “the job” is not simply a situation directly linked to a product or service, but is a life situation desiring a transformation. Revealing what “jobs” customers would like to accomplish can offer more honest insight as well as the potential for better value for a company’s future investments. A “job” is not a customer’s expressed desire for what they would like to see in a new product. Henry Ford said it best: “If I asked people what they wanted, they would have said faster horses.” Customers are often unreliable and unaware of the emotional value they are seeking. Ultimately, “jobs” are not features that add value to a solution. Focusing on feature additions can lead to misguided products and not the fundamental life situation being desiring transformation. A “job” IS the task a person is trying to get done. The characteristics of a “job” ARE discrete to customer types and occasions. In the end, they ARE actionable statements that guide the design of new solutions. There are two types of “jobs” to be observant about when working to reveal a “job.” The first is functional and the second is emotional. “Functional jobs” are fairly straightforward… they are the practical issues the consumer is trying to satisfy. On the other hand, “emotional jobs” relate to how the consumer feels about the product, and what they believe is the perception of them using it. Stephen Wunker, Jessica Wattman, and David Farber reference the famous example of Beats By Dre headphones in their book, Jobs-to-be-Done. Beats was co-founded by music icon Dr. Dre and advertised as a response from musicians like M.I.A, Pharrell Williams, and Gwen Stefani, who could no longer stand their fans listening to their music on low-quality earbuds. However, in the audio market, companies like Sennheiser, Bose, and JBL create higher quality products for similar price ranges, and it’s not hard to find reviews about the lower end quality audio found in Beats headphones. Nevertheless, because Beats employed a prolific imagery of athletes and musicians using Beats by Dre, the satisfaction of being cool (the “emotional job”) makes Beats a major competitor in the headphone market. The consumer who buys Beats over Bose is not only fulfilling the “functional job” of receiving high-quality audio, but also fulfilling a desired social image among peers. A seat at the cool table. “Emotional jobs” relate to how the consumer feels about a product, and what they believe is others’ perception of them using it. Attitude is the consumer’s personality, image among peers, and their expectations of others. The consumer who views themselves as trending to popular culture is more likely to buy Beats headphones. The history of Beats headphones being developed as a reaction from pop stars becomes the image of the consumer. The consumer is connected to, and appreciates the art of, the latest stars. 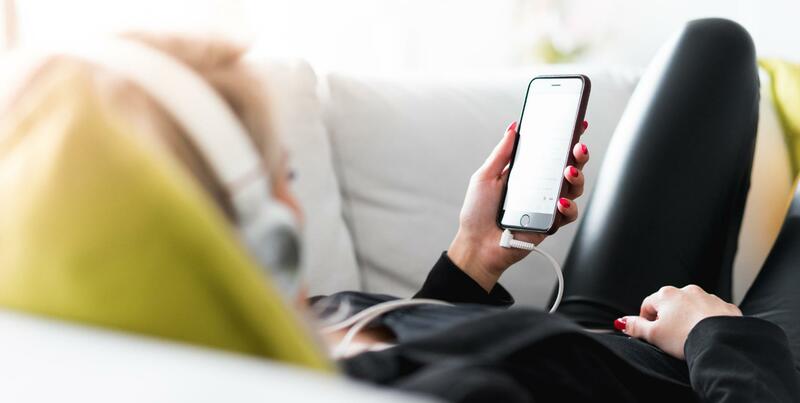 Conversely, a consumer who works in a tech-related job or a cutting-edge industry would likely choose Sennheiser or Bose headphones—not because they aren’t trendy or hip, but because they are projecting a persona of the “informed consumer.” Their peers are more adept and educated on the nuances of technology. To that person, Beats headphones may imply a lack of knowledge because of the lower quality audio. These consumers are fulfilling the job of meeting the expectation of their peers. Background is the long-term context behind a consumer. The background of a consumer includes cultural motivations, family expectations, and socioeconomic factors; for example, a teenager who wants to appear trendy, but comes from a conservative family who doesn’t like the image conveyed by hip-hop and pop stars. This consumer may still purchase Beats headphones, but choose the earbuds version over the larger over-the-ear product style. While the larger over-the-ear headphones are iconic, the earbuds allow a more discreet expression of personality. This purchase can help them satisfy the expectations of peers and family. The third element, circumstances, is more about short-term factors affecting the consumer’s decision-making process. For example, if a consumer is a two-season-sport athlete, the immediate circumstance of having to train and practice daily affects their purchasing behavior. Considering their circumstances, this consumer may choose the Powerbeats earbuds, which are specifically and ergonomically designed for athletic performance to not fall out of the ears. Customers don’t buy products because the product in and of itself is the goal. People do it in order to satisfy the demands of an underlying “job.” That “job” is a life situation desiring to be changed. For example, an athlete looking for more motivation during their workouts may purchase Beats headphones; a working professional starting their hour-long morning commute buys a strawberry milkshake from the drive-through before the highway onramp. By looking at these situations in a customer’s life, and applying the Jobs-to-be-Done framework, product designers can design products that provide long-term value to the customer. Jobs-to-be-Done offers a clear-cut framework for thinking about your business, outlines a roadmap for discovering new markets, new products, new services, and can help generate creative opportunities to innovate your way to success. What are the five stages of the consumer buying process? What is meant by the consumer research process? Consumer research is the research done on consumers’ preferences, attitudes, loyalty, usage and behavior in a market. It helps in understanding customers so that the marketing campaigns can be designed accordingly. Why is consumer research important? Effective consumer research can help gain invaluable information about competitors, economic shifts, demographics, current market trends and customer spending traits. A job-to-be-done is the process a consumer goes through whenever she aims to transform her existing life-situation into a preferred one, but cannot because there are constraints that stop her. What is a customer interview? Customer interviews are a common mechanism for gathering the voice of the customer (VOC). They are usually conducted one-on-one with an individual customer or with a small number of people from the same business or family unit. What is a consumer purchase decision? A consumer purchase decision is the process by which consumers identify their needs, collect information, evaluate alternatives, and make the purchase decision. These actions are determined by psychological and economic factors and influenced by environmental factors such as cultural, group, and social values.